The Thanksgiving Day high school football game between Greenwich High School and Staples High School at Greenwich, Conn., Thursday, Nov. 27, 2014. Staples defeated Greenwich by a score of 38-21. A host of circumstances have resulted in the Staples football team not beginning its season until Sept. 18 against Danbury, but the extra preparation time will serve as an opportunity to fulfil a single the goal the entire program has. That goal? Returning to the Class LL playoffs after a two-year absence. To do that, the Wreckers will have to play as well as they did down the stretch in 2014. A 38-21 win over Greenwich last Thanksgiving capped a four-game run in which the Wreckers won each time, scored at last 35 points and put it all together on both sides of the ball. Last year’s 7-4 effort was littered with games that got away. Two losses were decided by a field goal, and a third was by 11 points in which Staples led at the half. The downfall mostly came in pass defense; the Wreckers gave up over a 1,000 combined passing yards in FCIAC defeats to Stamford, New Canaan and Danbury. There is hope opposing quarterbacks will have a more difficult time in 2015, and it beings up front. 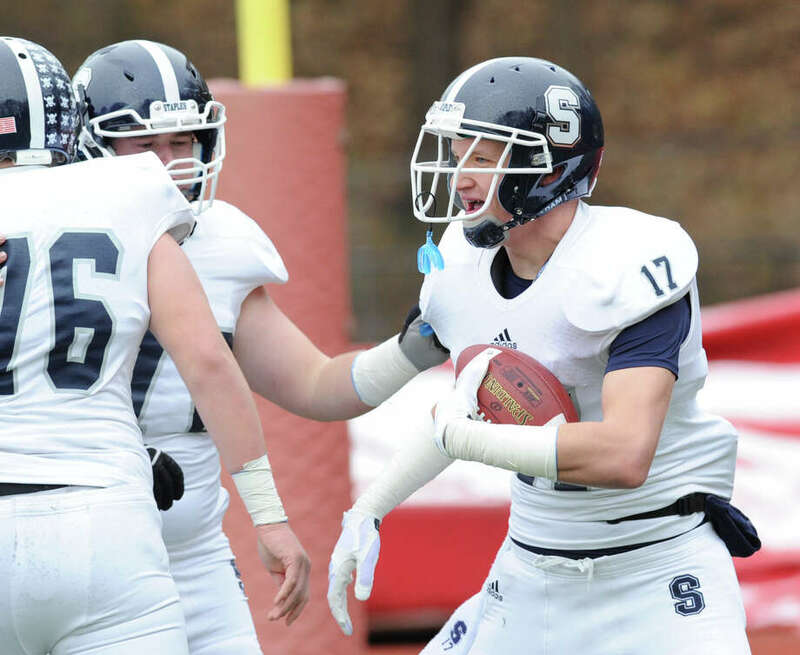 Seniors Jackson Ward and Evan Gilland - a first team All-FCIAC selection a year ago - lead a defensive line capable of generating pressure on the quarterback. Linebackers Riley Petta and Jack Griffin bring a more athletic component to the team, according to Petroccio. Junior quarterback Andrew Speed takes over the option-run attack from graduated seniors Teddy Coogan and Trevor Shearer. Running backs Ethan Burger and Connor Adrian will seek the bulk of the carries; Adrian hurt his shoulder early last season, and Burger took over to the tune of 1,260 yards and 11 touchdowns. The Wreckers hope to be a more balanced team this fall due to the potential receiving weapons. At 6-foot-5, Fitton, a junior, is a matchup nightmare at tight end who broke out with two touchdowns in the win over the Cardinals in the season finale. Fitton returns as the punter. Fellow tight end Gilland could open up the offense and Colin Hoy returns outside. Ward, Gilland, Ben Thaw, Adrian and Jack Griffin will serve as captains in 2015. The Wreckers’ nine-game regular season schedule is backloaded with FCIAC contenders St. Joseph, Darien and Greenwich in the final three weeks of the regular season. Should Staples reach the FCIAC title game, a fourth game against a top tier team would come before Thanksgiving. Staples hopes a fifth in the Class LL playoffs is added to the plans in December.